Once I learned how to make lemonade with lemons, I never turned to powder again. This homemade lemonade is especially delicious because it includes a secret ingredient I discovered when I lived in Italy: basil simple syrup–and it only takes a few minutes to make. You make the simple syrup with fresh basil leaves and sugar that you boil in water, then mix with fresh squeezed lemon juice and more water. My kids both like it a lot and they could detect that something was deliciously different about it, but they agreed that it doesn’t taste like “basil” at all. I think that extra taste makes it extra special for afternoons spent enjoying the sunshine on the patio, or having lunch with friends. To dress this summer drink up, you can serve it with ice cubes that have frozen basil leaves in it, and drape a slice of lemon over the side of the glass. For adults, mix in the alcohol of your choosing! Mix lemon juice, water, and the basil simple syrup in a pitcher. Stir in the refrigerator until ready to serve. Combine the basil, water, and sugar in a small saucepan. Remove from the heat and strain it, then set aside to cool. 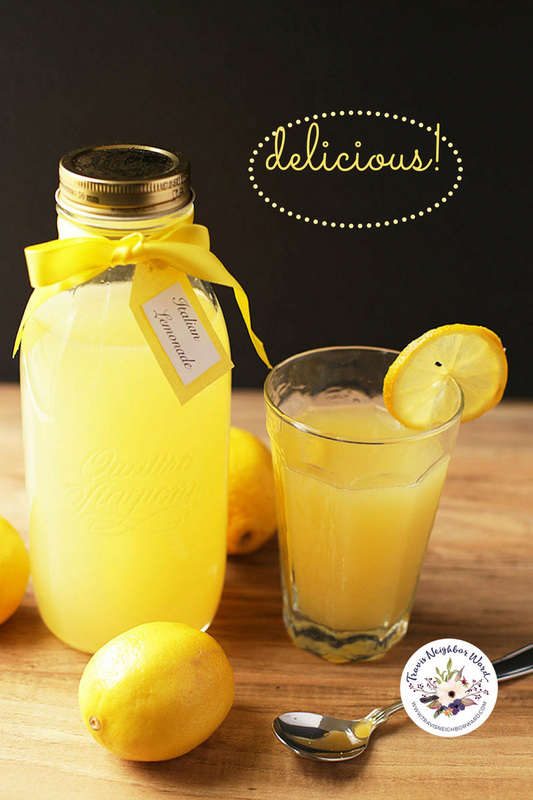 Do you know another great way to make lemonade? Please share in the comments section below!